This is the first of a series of quarterly reviews on selected topics of electrical/electronic connector technology. You are invited to suggest a review topic of interest. 2001 Conferences on Electrical/Electronic Interconnections and Electronic Packaging. Lubricants (solid and liquid) or sealant greases are often used to enhance the performance of electrical connectors. Although there is considerable evidence about the benefits of these materials, there is still debate and confusion about the range of applications, and the limitations, of lubricants and greases in electrical connectors. Let us clarify the technical jargon. In the electrical connector industry, the term "lubricant" is generally employed only in reference to separable electronic connectors where maximum power dissipation is relatively low, say 0.1 - 0.5 watt or less. Separable connectors may operate in a hot environment, sometimes approaching 2000C, as under an automobile engine hood. The major functions of a lubricant in separable connectors are to reduce friction during installation and minimize mechanical wear during connector service. There are other expected functions of the lubricant, as we will see later. Again as regards technical jargon, the term "sealant grease" is generally used in reference to permanent electrical connections as in bolted and compression connectors. In these connector types, maximum power dissipation extends beyond about 0.5 watt, often reaching several watts or even tens of watts. Such connectors are confined largely to the transportation, power electronics and power-utility industries. Although the term "grease" suggests a lubrication function, the major function of a "sealant grease" is to mitigate ingress of corrosive material into electrical interfaces with the conductors. Lubricants intended for separable connectors come in two forms, solid and liquid. 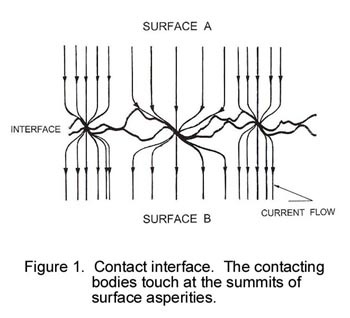 Because an electrical interface is produced by contact of micro-asperities on the surfaces of mating bodies, as illustrated in Fig.1, an effective connector lubricant must not interfere with the formation of electrically-active contact spots (also known as a-spots ). For this reason, a lubricant must be either electrically conductive or, if non-conductive, it must be easily displaceable from areas of potential a-spot formation. There are relatively few solid lubricants available to the connector industry. Despite their excellent lubrication properties, solids such as Mo2S, H3BO3  and multicrystalline waxes are not used in electrical contacts because they are neither good electrical conductors nor easily displaceable in an interface. On the other hand, lamellar graphite is often used in power contacts, particularly with electrical brushes in machinery and electric trains, to take advantage of the unique lubrication and electrical conductivity properties of that material . Currently, the only widely used solid lubricant in separable electrical connectors is gold deposited as a thin layer. So-called "hard" gold, consisting of gold alloyed with a small amount (< 1wt%) of cobalt or nickel, offers acceptable lubrication properties. The excellent electrical conductivity properties of gold also promote superior electrical connectibility. The lubrication offered by hard gold is superior to that of pure gold because unalloyed gold is soft and tends to stick to a mating surface. This stickiness leads to an increase in friction as illustrated in Fig. 2. 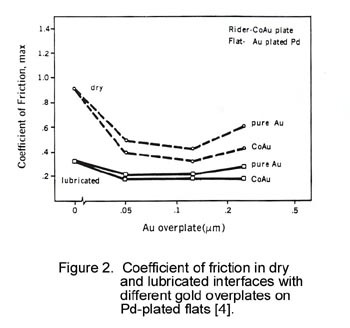 Optimal lubrication with hard gold is achieved for a layer thickness of about 0.1 micrometer . At this layer thickness, the coefficient of friction (COF - the ratio of drag force to contact force) drops to about 0.3 as illustrated in Fig. 2. Thicker layers lead to "ploughing", whereby the gold is pushed out to the front and sides of a wear track during sliding, thus increasing friction. Other materials such as palladium-nickel and palladium-cobalt are being investigated as solid lubricants in separable connectors . We now consider liquid lubricants. Liquid lubricants usually reduce the COF to the 0.1 - 0.2 range . The COF is relatively independent of lubricant layer thickness so long as the speed of interfacial displacement remains relatively small (i.e. no larger than several centimeters per second). This constancy of friction stems from the expulsion of any significant lubricant accumulation from the contact region, leaving only a molecularly-thin lubricant film in the interface. This lubrication mechanism is known as "boundary" lubrication and is illustrated in Fig. 3 . Reduced friction stems from an inability of the residual lubricant layer in the interface to sustain any significant shear force during sliding. Boundary lubrication is sustained only if the bonding energy of lubricant molecules to the rubbing surfaces is sufficiently large. . If this bonding energy is too small, the lubricant does not adhere well to the contact surfaces. In this event, lubricant molecules become incapable of supporting a contact load as illustrated in Fig. 3 and can be easily squeezed out of the contact interface [8,9]. This mechanical dispersion of molecular lubricant layers leads to high friction and large adhesive wear during sliding. In addition to reducing friction and minimizing mechanical wear, a liquid lubricant must mitigate fretting corrosion and protect against atmospheric corrosion in contact areas of a connector. Liquid lubricants are ideally suited to perform these additional functions due to their ability to be displaced back and forth over contact areas by random or imposed displacements in a sliding interface. This motion leaves molecularly-thin deposits between larger lubricant pools, which can lead to substantial surface coverage  and protection against corrosion since lubricant layers (no matter how thin) block metal oxidation sites. Clearly, the ability of a lubricant to protect against corrosion relates to the bonding energy of the lubricant with the contact surfaces. Too small a bonding energy compromises the ability of the lubricant to stick and undermines its corrosion-inhibiting properties. One highly desirable property of connector lubricants is the ability to remain localized near an area of contact and not spread over connector surfaces where the lubricant is not needed. Although some spreading of the lubricant is desirable to maximize surface coverage, minimize friction and enhance protection against corrosion, excessive spreading can be detrimental to connector performance. A full discussion of wetting and spreading characteristics of lubricants is beyond the scope of this review. However, the use of connector lubricants such as perfluoroalkylethers was discontinued because of pervasive unwanted spreading of these liquids . Usually, a liquid lubricant is first diluted in a solvent and then deposited on the connector contact surfaces. The lubricant remains as a deposit after the solvent has evaporated. One important properties for an effective lubricant is a low vapor pressure, and hence a low evaporation rate, over the service temperature range. This insures survival of the lubricant over the expected life of the connector. Liquid lubricants owe part of their lubrication properties to the length of the molecular chain. In general, the longer the length of the lubricant molecule, the farther away the sliding surfaces are kept apart during sliding. 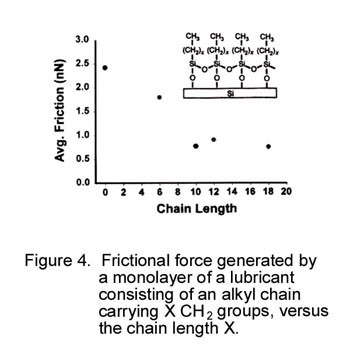 Hence the COF decreases with increasing lubricant molecular chain length, as illustrated in Fig. 4. One prerequisite for effective lubricant action in electrical connectors is chemical inertness towards the metal surfaces to be lubricated. For example, lubricants used on copper or silver-plated surfaces should not carry sulfur-containing compounds since these may react with the metals to generate resistive metal sulfide films and increase contact resistance. Similarly, lubricants used with aluminum connectors (e.g. in power-utility connections) should not contain carboxylic acid or equivalent additives (which are excellent lubricants) since these materials react with aluminum to generate electrically-insulating oxide layers . In recent years, one family of lubricants identified as polyphenyl ethers (PPEs) has been used successfully in tin-plated, gold-based material systems and other metals in separable connectors . Some formulations of PPEs have been more successful than others in minimizing fretting corrosion and increasing resistance to atmospheric corrosion in separable connectors . The reasons for the effect of PPE chemical structure on resistance to fretting and atmospheric corrosion  are currently unclear. The elucidation of the relationship of chemical structure to lubricant properties promises to yield a new generation of lubricants with superior protection properties for separable connectors, and lower cost. Greases are widely used in permanent power connectors deployed by the power-utility, power electronics and transportation industries. These connectors comprise bolted, compression and wedge-type devices. In power-utility applications, the connectors are generally supplied with the grease already applied to the contact surfaces. Greases are pastes consisting of a thickening agent, one or more lubricant materials and possibly other chemical compounds such as antioxidants. The thickeners include finely divided silica, soaps, clays, Teflon powder and various gelling agents usually at 5-10 wt% concentration. Grease structures generally consist of interlocked fibrous crystallites or finely divided particles with a large surface area. The solid components of a grease form a matrix in which lubricants, antioxidants and other additives are entrapped. The COF provided by greases is generally larger than that produced by liquid lubricants i.e. 0.3-0.5 for greases versus about 0.2 for liquid connector lubricants. This difference usually stems from the presence of solid materials in the greases. Greases used in electrical power connections may also contain fine particulate material. The particulates may comprise a hard abrasive material such as a ceramic or hard metal, or consist of a relatively soft metal such as zinc or silver. Hard grit material is used in conjunction with aluminum connections to abrade electrically-insulating aluminum oxide films on the surfaces of conductors and connectors, and allow the generation of large areas of metal-to-metal contact. The use of soft metals is designed to penetrate surface contaminant layers, including tenacious oxide layers, to form electrically-conducting metal paths across electrical interfaces. One intended function of a grease in a permanent power connector is to inhibit corrosion by sealing electrical contact areas from the environment. The grease is introduced as a filler material to eliminate interstrand gaps within power cables and to fill voids at electrical interfaces with the connector. In a recent investigation of connector failure by corrosion in a marine environment , it was noted that grease residues left over in failed connections had not maintained their original paste consistency. The residual grease became dry, brittle and thoroughly interspersed within the corrosion products. In contrast, grease residues in connectors that had not failed in the same environment had kept their paste consistency. These observations point to a proneness of currently-used connector greases to react chemically with corrosion products. These observations indicate that greases (i.e. "sealant greases") designed for permanent connectors are not always capable of preventing the ingress of corrosive contaminants. The observations also indicate that much work remains to be done for the development of reliable connector sealant greases. Recent years have witnessed significant advances in the design of superior solid and liquid lubricants for separable connectors, and in the formulation of "sealant greases" for permanent connectors. Many of the advances have been achieved empirically by trial-and-error. Although this approach has been rewarding, it needs to be complemented by fundamental work to generate an understanding of selected properties of lubricants and greases. In the author's view, only the combination of empirical and fundamental work can accelerate significantly the development of truly innovative connector lubricant products. Holm, R., Electric Contacts, Theory and Applications, Springer-Verlag, Berlin, 1976. 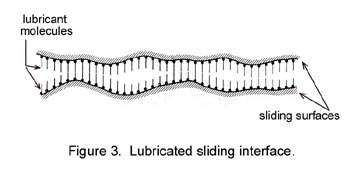 Singer, I.L., "Solid Lubrication Processes", in Fundamentals of Friction: Macroscopic and Microscopic Processes, Eds. Singer, I.L. and Pollock, H.M., p.237, NATO ASI Series, Kluwer Academic Publishers, London, 1992. Shobert, E.I., "Sliding Electrical Contacts (Graphitic Type Lubrication), in Electrical Contacts, Principles and Applications, Ed. Slade, P.G., p. 839, Marcel Dekker, Inc., New York, 1999. Antler, M., "Tribology of Electronic Connectors: Contact Sliding Wear, Fretting, and Lubrication", in Electrical Contacts, Principles and Applications, Ed. Slade, P.G., p. 309, Marcel Dekker, Inc., New York, 1999. Boguslavsky, I., Abys, J.A. and Eckert, V.E., "Electroplating of PdCo alloy for connector application", Proc. 29th IICIT Connector and Interconnection Symposium, p. 219, 1996. Bowden, F.P. and Tabor, D., The Friction and Lubrication of Solids, Oxford University Press, London, U.K., 1950. Fairlie, M., Pathak, B.R. and Timsit, R.S., "Reflection-absorption IR spectroscopy of organic monolayers on aluminum surfaces", Proc. 1985 Conf. Fourier Computerized Infr. Spectrosc., SPIE, vol. 453, p.496, 1985. Timsit, R.S. and Pelow, C.V., "Shear Strength and tribological properties of stearic acid films - Part I: On glass and aluminum-coated glass", ASME J. Tribology, vol. 114, p. 150, 1992. Timsit, R.S. and Pelow, C.V., "Shear Strength and tribological properties of stearic acid films - Part II: On gold-coated glass", ASME J. Tribology, vol. 114, p. 159, 1992. Antler, M., "Sliding studies of new connector contact lubricants", IEEE Trans. on Components, Hybrids and Manufacturing Technology, vol. CHMT-10, p. 1, 1987. Timsit, R.S., Bock, E.M. and Corman, N.E., "Effect of surface reactivity of lubricants on the properties of aluminum electrical contacts", IEEE Trans. On Components, Packaging and Manufacturing Technology, Part A, vol. 21, p. 500, 1998. Antler, M., "Electronic Connector Contact Lubricants: the Polyether Fluids", ", IEEE Trans. on Components, Hybrids and Manufacturing Technology, vol. CHMT-10, p. 32, 1987. Joaquim, M.E., "Connector contact lubrication with polyphenyl ether: a review", Proc. 30th Annual Connector and Technology Symposium, p. 217, 1997. Callen, B.W., Johnson, B., King, P., Abbott, W.H. and Timsit, R.S., "Environmental degradation of utility power connectors in a harsh environment", IEEE Trans. CPT, vol. 23, p. 261, 2000. High Speed Digital Interconnects, 14 - 16 January 2001, Radisson Resort and Spa Scottsdale, Scottsdale, AZ, [ www.iwpc.org ]. IEEE 14th International Conference on Micro Electro Mechanical Systems, 21 - 25 January, Casino Kursaal Interlaken, Interlaken, Switzerland, [ www.ieee.org ]. Annual Reliability and Maintainability Symposium (RAMS), 22 - 25 January, Philadelphia Marriott, Philadelphia, PA, [ www.rams.org ]. The 2001 European Systems Packaging Workshop, 22 - 24 January 2001, Sitges, Spain, [ www.ieee.org ]. Microtech 2001, 28 - 31January 2001, Novotel, West London, England, U.K., [ www.imaps.org ]. 2001 IEEE Power Engineering Society Winter Meeting, 28 January - 01 February, Hyatt Regency Columbus, Columbus, OH, [ www.ieee.org ]. 2001 IEEE Burn-in and Test Sockets Workshop, 4 - 7 March, Hilton Mesa Pavilion, Mesa, AZ, [ www.bitsworkshop.org ]. International Symposium and Exhibition on Advanced Packaging Materials, 11 - 14 March 2001, Chateau Elan, Braselton, GA, [ www.imaps.org ]. Ceramic Technologies for Microwaves, 26 - 27 March 2001, Adams Mark Hotel, Denver, CO, [ www.imaps.org ]. International Conference and Exhibition on High Density Interconnect and Systems Packaging, 17 - 20 April 2001, Santa Clara Convention Center, Santa Clara, CA, [ www.hd-international.com ]. 2001 International Conference on Electronic Packaging (and 15th Electronic Show), 18 - 20 April, Tokyo Ryutsu Center, Tokyo, Japan, [ www.imaps.org ]. Advanced Technology Workshop on Thermal Management for High -Performance Computing and Wireless Applications, 20 - 21 April 2001, Sheraton Palo Alto Hotel, Palo Alto, CA, [ www.imaps.org ]. 2001 IEEE International Reliability Physics Symposium, 30 April - 3 May, Wyndham Palace, Orlando, FL, [ www.irps.org ]. IEEE MTT-S Ceramic Packaging Workshop, 20 - 25 May 2001, Phoenix, AZ, [ www.imaps.org ]. 2001 IEEE 51st Electronic Components and Technology Conference (ECTC 2001), 29 May - 1 June, Buena Vista Palace, Orlando, FL, [ www.ieee.org ]. 13th Microelectronic and Packaging Conference, 30 May - 1 June 2001, Strasbourg, France, [ www.imaps.org ]. 2001 IEEE International Interconnect Technology Conference, 3 - 6 June, Hyatt Regency Hotel, Burlingame, CA, [ www.his.com/~iitc ]. Topical Workshop and Exhibition on Flip Chip Technology, 18 - 20 June 2001, Four Seasons Hotel, Austin, TX, [ www.imaps.org ]. 2001 8th International Symposium on Physical and Failure Analysis of Ics (IPFA 2001), 9 - 13 July, Westin Stamford and Westin Plaza Hotel, Singapore, [ www.ewh.ieee.org/reg/10/ipfa/ ]. 2001 IEEE Holm Conference on Electrical Contacts, 10 - 12 September, Hotel Wyndham Montreal, Montreal, Canada, [ www.ewh.ieee.org/soc/cpmt/tc1/2001call.html ]. 34th Annual Connector & Interconnection Technology Symposium & Trade Show, 1 - 3 October 2001, Disneyland Hotel and Conference Center, Anaheim, CA, [ www.iicit.org ]. 34th International Symposium on Microelectronics, 9 - 11 October 2001, Baltimore, MD, [ www.imaps.org ]. 2001 IEEE/PES Transmission and Distribution Conference and Exposition, 28 October - 2 November, Georgia World Congress Center, Atlanta. GA, [ www.ieeet-d.org ]. Behaviour of Electrical Equipment and Components in Tropical Environments, 3  7 September, Radisson Plaza Hotel, Cairns, Australia, [ www.cigre.org/GB/IMEETINGS/fsIM.htm ].